It is hard to believe, but true nevertheless, that no-one in the Western world had heard of Karma, or knew the slightest thing about it, until only 130 years ago when Madame Blavatsky and the Theosophical Movement introduced the concept of Karma – along with other distinctly Eastern teachings such as reincarnation and the Oneness and Divinity of all life – to the West. Karma was literally a foreign concept to begin with but its truth and reality were swiftly perceived by many and eventually the word and the basic idea behind it entered into the mainstream. Today, almost everyone in the West has heard of Karma and has at least some faint notion of what it means. But what exactly does it mean and how does it work? Many people misunderstand and misrepresent this noble and ancient spiritual teaching. Theosophy states that Karma and Reincarnation are the two most vitally important spiritual concepts for humanity to accurately understand. We hope that these ten points will help to bring about a better and also a more practical understanding of the Law of Karma. 1. “Karma” literally means “action” and “deed” in the ancient Sanskrit language of India. It is the Law of Cause and Effect, Action and Reaction, Sequence and Consequence. We are always setting causes in motion, every moment, through our every act, our every word, and even our every thought. For every cause set in motion, there is a corresponding and correlative effect which comes back. This is the way the universe maintains its harmony, balance, and equilibrium. If a cause was to ever be set in motion without having a corresponding effect, then the entire universe would immediately cease to be, since its continuity and existence depends on this great Law of balance and adjustment. But that will never happen because Karmic Law is immutable Law. In the words of H.P. Blavatsky, the Law of Karma is “the ultimate Law of the Universe.” Every self-conscious being in the universe, without exception, is subject to the Law of Karma. Every being in possession of individual self-consciousness and the intelligent power of choice, is a creator of Karmic causes. 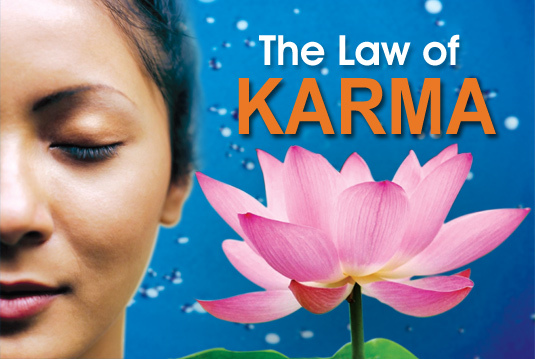 Karma is the Law of self-created destiny and everything in the universe proceeds according to this Law. It can be good or bad, positive or negative, depending entirely on the nature of the causes we set in motion. It is entirely impersonal, yet it is entirely just and fair in its working. 2. To try to ESCAPE Karma is to create even worse Karma for yourself. Not only is it grossly unphilosophical, impossible, and spiritually and emotionally immature, but to attempt to somehow PREVENT and AVOID the manifestation of the effects of the causes that you yourself have set in motion is to attempt to engage in nothing less than cosmic injustice! 3. Many people have a one-sided view of Karma, where they gleefully say such things as, “Karma’s going to get that person who wronged me…I can’t wait for Karma to catch up with them!” whilst completely ignoring the fact that the person wouldn’t have been able to wrong them or harm them in the first place if it wasn’t for their OWN negative Karma. Karma is never one-sided. For every effect, there was a cause. For every cause, there will be an effect. People who look forward to Karma “catching up” with others are just creating even worse Karma for their own future by their lack of compassion and spiteful nature. 4. Karma and reincarnation are inextricably linked with each other. You can’t have one without the other. It is obvious that one single lifetime is by no means long enough to reap the full effects of every cause we have set in motion during that lifetime. It is also apparent that some of the aspects and circumstances of our current lifetime do not have their origins in the current lifetime but seemingly in the distant past. Physical incarnation itself is a Karmic effect, since one of the main reasons we reincarnate is in order to deal with our past Karma. To have a proper understanding of Karma, a person must also accept and believe in reincarnation. To have a proper understanding of reincarnation, a person must also accept and believe in Karma. 5. There are three divisions of Karma and in Hinduism these are called Sanchita Karma, Prarabdha Karma, and Agami (also known as Kriyamana and Vartamana) Karma. A person’s Sanchita Karma is their “Karmic account” or “Karmic reservoir,” the storehouse of all their Karma from past lives that has not yet been dealt with. Prarabdha Karma is the specific portion of that Sanchita Karma which the person is destined to face and experience in the present lifetime. If successfully dealt with, that portion of their Karma will then be exhausted and wiped out. Agami Karma is the fresh Karma we are creating for ourselves right here and right now, as we live this present lifetime. It becomes added to our Sanchita Karma and will manifest itself as our Prarabdha Karma in future lifetimes. 6. It is true that we all have “a lot in life.” It is our Karmic lot, our Karmically determined allotment of situations, circumstances, and experiences. We should always strive for the best but when we just cannot succeed as we would like to in certain areas of life, no matter how hard or often we try or what we do, we should accept it as an indication of our Karma and be thankful and content for what we do have, rather than frustrated and depressed over what we do not or cannot have. No amount of positive thinking, creative visualisation, affirmations or prayers, can alter your Karmic lot in life. This is your Prarabdha Karma. This is not fatalism; it is the Law of self-created destiny. In the past you created your present and in the present you are creating your future. 7. EVERYTHING that happens to us is either Karmically DESTINED or Karmically PERMITTED. It cannot be otherwise, since nothing can happen outside the Law of Karma. Some things in our life are specifically destined to happen to us, as a result of our Karma, while others are merely permitted. There are also things which do not happen to us, because our Karma will not permit it. Person #1 and Person #2 are walking along together at night when a madman suddenly appears and stabs Person #1. It seems likely that he would also stab Person #2 but for no apparent reason he runs off without doing so. Person #1 was either Karmically destined to be stabbed or their Karma permitted that they could be stabbed, even though it hadn’t been specifically destined to happen. The Karma of Person #2 neither destined nor permitted such a thing to happen to that person. While our Karma may sometimes seem like our greatest “punisher,” it can also be our greatest guardian and protector. 8. The Law of Karma applies to everything in the manifested universe. As well as individual Karma, there is also family Karma, group Karma, national Karma, racial Karma, planetary Karma, and beyond. 9. Karma and reincarnation are found clearly expressed in the world’s oldest religion – Hinduism, in Buddhism, and in other Eastern religions but it is not solely an Eastern teaching. Reincarnation and Karma were part of the teaching of Christianity until the 6th century A.D. At the Second Council of Constantinople in 553 A.D. those teachings were repudiated, declared heretical, and officially replaced with doctrines which are more representative of the present form of Christianity. Although the Law of Karma and Reincarnation is not taught in the public, exoteric teachings of Christianity, Judaism, Islam, etc., it is taught in the inner, esoteric teachings of those religions and indeed of every religion. 10. The only way to free ourselves from negative Karma is to stop setting negative CAUSES in motion! To avoid creating any further future sorrow and suffering for yourself, stop creating it for others. Live your life consciously and harmlessly. Gain complete mastery over your thoughts, words, and deeds and live to be of help and service to others. But don’t let your underlying motive for this be one of selfishness – i.e. for the sake of creating good Karma for yourself – but rather live the life of love and compassion simply because it is the right thing to do. Love goodness and virtue for its own sake…realise that selfishness is the great curse of humanity…and live merely to be an impersonal beneficent force for good in this world. If you liked this article, you may also like A Right Understanding of Reincarnation and The Sevenfold Nature of Man. Excellent, concise exposition here, thanks! Simple, yet so profound! Thank you for posting this. I will share this article. Hello Allan, which part of it are you having difficulty with? Good article which explains everything one needs to know. I have been thinking about family karma a lot recently, due to the fact that both my parents were seriously ill for the last 10 years of their lives, and I am following in their steps! My wife is also seriously ill, she has Fibromyalgia and needs a test to see if she has MS. I have a genetic disorder which I only found about 11 years ago ! My wife’s mum had MS and Emphysema, so there does appear to be a connection between our two families regarding ill health. I know my sense of humor is influenced by my dad – thanks dad 🙂 I will have to seriously research reincarnation, and would like to know where I can find out more. Where would I find out more regarding the editing out of reincarnation from the Christian religion. Also I am of the school of thought which says Jesus was a fictional character, an invention of Rome. Thank you for your comment and please accept our sympathies regarding these various health issues you mention. An understanding of the Law of Karma gives us greater strength and calmness to be able to bear such burdens, as we begin to realise that everything is according to Law and that there is in reality no injustice, no matter how unfair and unjust many things in life may seem to be. There is only perfect justice, i.e. harmony, balance, equilibrium. To answer your questions, you may find it useful to take a look at some of the articles listed under the heading “DEATH, THE AFTERLIFE, & REINCARNATION” on the “Articles” page at https://blavatskytheosophy.com/articles/. In particular, you may find many of your questions regarding reincarnation, Christianity, and the historicity (or otherwise) of Jesus dealt with in the articles “Reincarnation and Christianity” (https://blavatskytheosophy.com/reincarnation-and-christianity/) and “Dismantling the Christian Edifice” (https://blavatskytheosophy.com/dismantling-the-christian-edifice/). Thank you for your comment and question Nilla. The answer from the Theosophical perspective is that it is BOTH. Similarly, if someone does an act of kindness and generosity for us, it is both our Karma AND their free will and choice to do such a thing. This is explained by the fact that human beings are very often the “agents” through which the Law of Karma works in its bringing to us of the things and experiences we have deserved and created, both positive and negative. You referred to the example of child abuse. If someone is abused as a child, it is the Karmic effect of past causes set in motion – of course in a previous incarnation – by that soul. At some time or another, the soul would have to face the inevitable reactions of its own actions, for this is simply the way, the means, and the method, whereby the Universe maintains its harmony, balance, and equilibrium. That reaction could potentially come into expression and objective manifestation in various different ways but if there is someone in that child’s sphere of contact who is evil and twisted enough to want to abuse the child, then the Karmic reaction may come via that person if there is nothing to prevent him or her from committing the acts of abuse. But all the same, the soul responsible for the abusive acts against the child will in turn have to face similarly heavy Karmic penalties of its own. It is taught that “Rigid Justice rules the world.” Karma may not always work in the way we expect or imagine it to work but it always will and does work, for it is incessant and impersonal in its operation and inherent in the very fabric of the Universe. Perhaps the solution to your concern about Karma lies in the understanding that the part of us which goes from life to life, body to body, is the unseen inner being, the soul within, the Reincarnating Ego or “I”, the permanent individuality, the Higher Manas or Mind-Entity. No-one else makes us do what we do. We always have the power to choose. So there is no injustice in this continual process of Karmic re-adjustment and re-balancing. And it is not actually a bad thing, for it is the means by which the soul evolves, learns, and ultimately progresses and attains to higher and purer levels of consciousness. Please feel free to post any further questions or comments you might have on this or other topics. You can find more articles dealing in greater depth with this subject on the “Articles” page at https://blavatskytheosophy.com/articles/. Thank you so much. I’m sure this site is helping innumerable souls. I also got the ahha moment. So forgiveness plays an important role so the soul can release from the karmic ties and come back and have ties with these souls if not forgiven. So living in non judgement and non blame. Nice article. Honestly, I didn’t know there was a group/family karma. like, how does that work? A family or a group or a race or a nation – and even a planet – are collective aggregates of individual souls. Each of those souls has its own Karma but the collective Karma is the combined total Karma of all the souls in that particular group. None of us exist separately or independently. We think and speak of “our own Karma” and in a sense that is not a bad expression but the reality is that “our” Karma is part and parcel of a bigger Karma, working itself out in various different directions and expressions. This is only a basic answer but hopefully will help to answer your question. We would recommend a study of the writings of H.P. Blavatsky and William Q. Judge for more detailed explanations and understanding.